Q. Do you accept payments over the telephone? Office Hours: Monday-Friday: 8:00 a.m. – 4:30 p.m.
Q. Is there a grace period for payments? A. 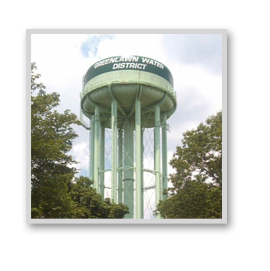 In accordance with Town Law, overdue water bills as of September 15, 2007 will be entered on property tax bill. Any water charges placed on the tax bill will be subject to a 10% penalty charge. Q. When is my next payment due? A. You should receive a bill every three months. Q. How is my bill computed? 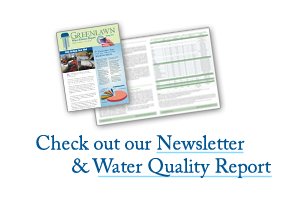 A. Greenlawn’s billing cycle is based on a 90-day (quarterly) billing cycle for three months of use. Your bill is based on water consumption as registered through a meter. Payments and rates are graduated by usage, with an 8,000-gallon minimum. Q. Why didn’t I receive a bill? A. You should receive a water bill quarterly (every three months). If you didn’t receive a bill within the scheduled time frame, please call our offices at 631.261.0874. Q. Why is this bill higher than my previous bill? A. If you feel your bill is too high, please contact us directly. You can also make an accurate examination by comparing bills from corresponding periods (e.g., June 2015 vs. June 2016). Many factors can contribute to fluctuations in your water bill especially the weather, living conditions and especially leaks. Contact us and we will check your readings and your system for leaks. Q. Is an estimated bill a true reading? A. No. Estimated bills generally are issued when inclement weather prevents actual readings. If you desire a true reading of your meter, please contact GWD directly.